Galvanized Structural Steel Guard Rail Systems Provide Safety And Security For Outdoors And In Wet Conditions. Galvanized Structural Steel Guard Rail Systems are made with galvanized steel finish to provide long lasting durability. Steel barrier rails and posts restrict access to security areas and more to protect personnel, inventory and equipment from and posts have a durable galvanized steel finish. 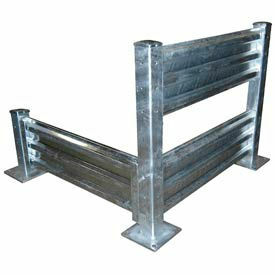 Available styles are Guard Rail and Post/Double Rail in 4'L, 6'L, 8'L, 10'L and 42"H double Rail Post. Rails are made with triple edge corrugated steel for high impact resistance. Post mounting kit sold separately.